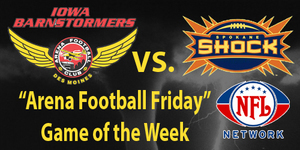 03/24/2011 12:11 PM - DES MOINES – The Iowa Barnstormers will seek its first win of the young 2011 season before a national audience as the team announced today that Friday’s 2011 home opener against the defending AFL champion Spokane Shock will be televised live nationally on the NFL Network, as the AFL’s Game of the Week. Friday’s game from Wellmark Field at Wells Fargo Arena in downtown Des Moines will kick-off at 7:05 p.m. Iowa time. Former University of Iowa quarterback and veteran NFL Network broadcaster Paul Burmeister will handle the play-by-play duties. Wellmark Blue Cross Blue Shield, which is one of the franchise’s top local partners, will be providing free commemorative rally towels to the first 5,000 fans through the gate Friday night. The nationally-televised game will feature two teams still searching for their first win of the 2011 AFL season. Iowa (0-1) lost its season opener last Saturday in Pittsburgh 58-28, while Spokane (0-2) opened the season with a week one road loss to San Jose and a week two home loss to Cleveland. Noting that nearly two-thirds of the Barnstormers 2011 roster is playing their first season in Iowa, Head Coach John Gregory said a home game before a large and loud crowd may be just what the team needs to notch its first victory of the season. “There is nothing like playing in front of thousands of screaming Barnstormers fans, and the players know how important a boost that is to our team. We are looking forward to introducing the fans to many of the talented, new Barnstormers,” he said. One of those newcomers is quarterback Brad Banks. Banks, the former University of Iowa standout, threw for 283 yards and four touchdowns in his first career AFL start. All four scoring strikes were hauled in by former Iowa State star receiver Todd Blythe, who also led Iowa with nine receptions for 131 yards. On the defensive side of the ball, Gregory said the team showed signs of improvement along the defensive line as newcomer Chance Talbert had three sacks against Pittsburgh, but as a whole, the unit did not register a takeaway in the game. Spokane, the 2010 Arena Bowl champion, is led by veteran AFL quarterback Kyle Rowley, who has thrown for twelve touchdowns on the season. Tickets, which start as low as $15.00, are on sale now for Friday’s game. They can be ordered by visiting www.theiowabarnstormers.com, calling 515.633.2255, or by visiting the Wells Fargo Arena box office.